Yawning is not uncommon in the parrot world. Yawning is in no way exclusive to human beings. Whether you're around a dog or a parrot, you may just catch the creature partaking in the sleepy-looking act. Parrot yawning has a variety of possible causes, from pure exhaustion to the need to stretch the muscles, plain and simple. 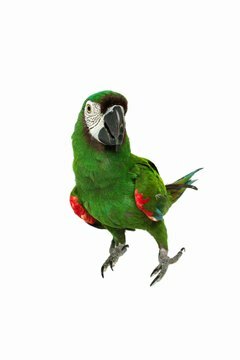 The exact reason behind parrot yawning isn't fully certain, according to BirdChannel.com. However, the action could mean that the bird just needs to get some sleep. It also could mean that he's simply trying to change the current positioning of his facial bones. One thing is certain, however, and that is that you're definitely not seeing things when you notice your birdie partaking in a languid, drawn out yawn. Parrots also sometimes yawn once they're through grooming their feathers via beak -- a process known as "preening." If you notice your parrot yawning repetitively after preening, it may just be his way of getting his crop back in order. Excessive yawning may indicate that something is lodged inside of your parrot's throat, indicates the Parrot Chronicles website. Whether some birdseed or dust is persistently stuck in the throat, a parrot's body may reaction by yawning, yawning and more yawning. If you stroke your pet parrot and notice him yawning as a response to your kindness and undivided attention, then he may just be displaying some good, old-fashioned peaceful happiness, nothing more and nothing less. If your parrot yawns as you pet him, he may just be expressing to you his joy and relaxation, advises the Beak 'n Wings Inc. parrot rescue website. Occasional yawning in parrots should be no cause for alarm. However, if your poor birdie's yawning seems unusually excessive, take him to an avian veterinarian to make sure that nothing is wrong health-wise. In some cases yawning in parrots is associated with health ailments -- think yeast infections, for example. BirdChannel.com: Why Do Pet Birds Yawn? Beak n Wings, Inc.: Yawning or Not?